The VoSI Focus List is a compilation and reference list of stocks for which Pocket Pivot or Buyable Gap-Up Reports have been issued. It is not intended as a "buy list" or a list of immediately actionable recommendations. Stocks on the list may or may not be in proper buy positions, and investors should exercise discretion and proper judgement in determining when and where stocks on the Focus List can be purchased. The following notes are intended to assist in this process. Please note that members can enlarge the Focus List image by clicking on the body of the email and then holding the Control Key while pressing the "+" key until it is large enough to read. Three more names were added to the VoSI Focus List this week despite the market gyrations that centered primarily around news of the recent healthcare legislation known as the American Healthcare Act, or the AHCA. These are discussed in a separate weekend review Market Lab Report sent out this weekend. With the AHCA vote being pulled, the market will now likely turn its attention to other components of the Trump Administration's proposed policy initiatives such as tax reform. This too may create market volatility depending on the related news ebb and flow. In an environment like this, investors are better off looking to enter on constructive weakness into a logical area of support such as a prior moving average of the top of a prior base. One then uses that same area of support as a tight selling guide, which helps to keep risk to a minimum in the event the market selling pressure begins to intensify. This is a far better way of operating than simply chasing strength, something we strongly advise against, except in the situation where a stock is posting a buyable gap-up (BGU) move. In that case, buying as close to the intraday low of the BGU also helps to keep risk to a minimum. Both the Market Direction Model (MDM) and VIX Volatility Model (VVM) remain on their buy and sell signals, respectively. Removed from the List this Week: Zions Bancorp (ZION) split wide open this past week after violating its 50-day moving average last week. Financials, which have been an area of market leadership previously, have come under severe pressure which could be a negative sign for the market unless we see some strong, healthy rotation into other groups. US Steel (X) has been on our short list and was removed from the Focus List for definitively violating its 50-day moving average. One stock, TSLA, remains on both lists which illustrates the importance of maintaining a fluid stance in such stocks, as it could go either way. Focus List Stocks Expected to Report Earnings this Week: None. Amazon.com has failed on a breakout attempt this past Tuesday. The stock reversed on heavy volume and is now trading below its 20-dema. It must hold critical support at the 50-dma to remain viable. Alibaba (BABA) has moved to higher highs, but was most recently buyable at its 20-dema on Wednesday of this past week. As we've written before, this must be bought on weakness into the 20-dema rather than chasing its many displays of short-term strength on the upside. Chemours Company (CC) is holding tight at its 10-dma as volume dries up, a lower-risk entry position. Netflix (NFLX) failed on a breakout attempt this past Tuesday and is now back below its 20-dema, similar to AMZN. It must continue to hold support at the 50-dma to remain viable. That said, the fact that it is sitting at the 50-dma does put it in a lower-risk entry position using he 50-dma as a tight selling guide. Netease (NTES) has regained its 20-dema and held tight at the line on Friday with volume drying up nicely. This puts it in a lower-risk entry position using the 20-dema as a tight selling guide. Otherwise the prior 278.80 BGU intraday low of February 16th would serve as a maximum selling guide. 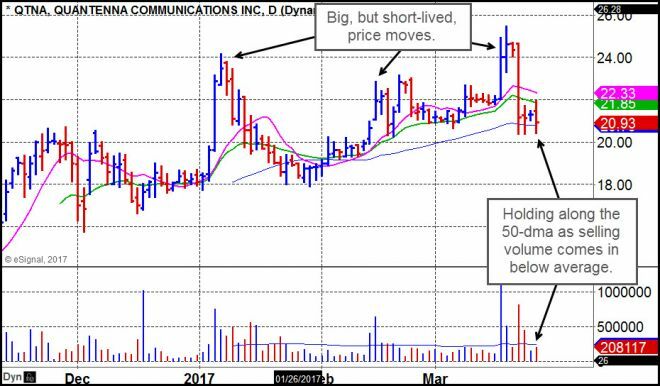 Quantenna Communications (QTNA) has been slammed back to its 50-day moving average after posting a strong breakout on heavy volume at the end of the prior week. This is typical for this thin small-cap name as it tends to have huge price moves of 15% or more that should be sold into followed by sharp breaks back to support. This move back into the 50-dma could be seen as a lower-risk entry spot using the line as a tight spot. 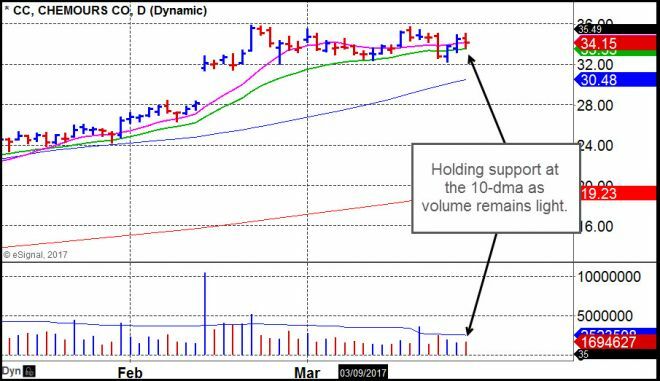 The price/volume action looks questionable however, but in this market this is typical of what we call "Ugly Duckling" action that can simply result in the stock finding support and then turning back to the upside. QTNA has done this several times since we first put it on the Focus List back on January 3rd as you will note in our report updates on this stock such as the one on March 11 where we remarked it was setting up nicely as a volume dry-up pullback. Square (SQ) under its prior 16.32 BGU intraday low from February 23rd this past week but rallied in an undercut & rally type of move. On Friday the stock pulled into its 20-dema on volume that was -37% below average, thus this pullback could put the stock in a lower-risk buy position using the 16.32 price level as a selling guide. Tesla (TSLA) is an example of a new type of undercut & rally set-up that we have identified as viable in the current market environment. 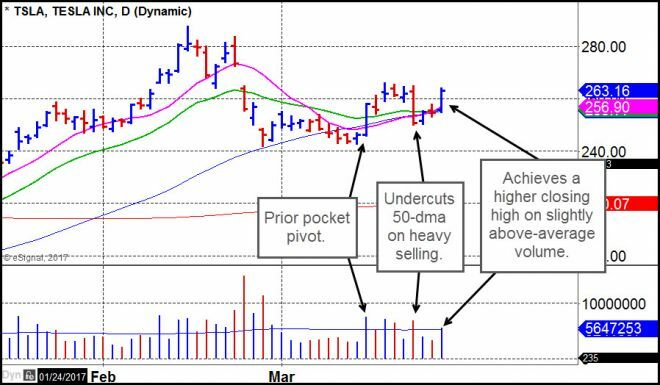 When a stock undercuts a key moving average and then is able to push back above that moving average, it can often be bought at that point, using the moving average as a tight selling guide. We can see that TSLA undercut its 50-dma earlier this past week, and then regained the line shortly thereafter, resulting in a nice upside move on Friday on above-average volume. All of this is occurring after a surprising bottom-fishing type of pocket pivot not quite two weeks ago.